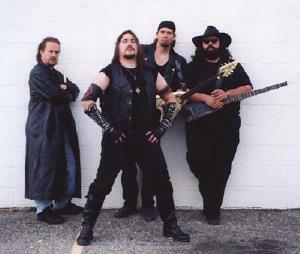 OVERLORDE was formed in 1985 by John "Kong" Bunucci (Bass / & Lead Vocals) and Mark "M.E." Edwards (Guitar & Backing Vocals). Dave Wrenn (Drums & Backing Vocals) joined shortly thereafter, and this "power metal" band played its first show at the SHOWPLACE in Dover, NJ that November. At this time in central New Jersey, the NWOBHM (New Wave of British Heavy Metal) was reaching a peak with bands such as IRON MAIDEN, SAXON , and DEF LEPPARD continuing their invasion from Britain. These and other bands, such as Germany's SCORPIONS, ACCEPT , and America's QUEENSRYCHE heavily influenced OVERLORDE. Additionally, the Old Bridge Metal Militia (local New Jersey metal fans) was thriving, Megaforce Records/ Rock and Roll Heaven had moved from their Route -1 Flea Market Store and Seton Hall's WSOU-FM was about to switch to an all-metal format that would have a major impact on the popularity of metal. METALLICA, one of Megaforce Record's first artists, was about to release Master of Puppets, so the form of "thrash metal" they made so popular was really just beginning. The band concentrated on originals from the start, with John handling the Lead Vocals along with Bass guitar. The band was joined by vocalist Pat O'Donnell in early 1986, who then took over the Lead Vocal role from John. The pace of live shows continued with the band playing in New Jersey, New York, and Pennsylvania. Venues included the STONE PONY, PARK VILLA II, ONSTAGE, BILLY O'S, ZAFFY'S, STREETS, SPOTSWOOD LAKE, the DIRT CLUB, the HIGH TIDE CAFE, CLOSE ENCOUNTERS, and the SHOWPLACE. The EP received praise overall in publications like VARIETY, KERRANG!! !, METAL RENDEZVOUS, POWERLINE, the AQUARIAN, and the EAST COAST ROCKER, and received airplay on metal radio such as WSOU and WDHA . However, Pat and the band parted ways around the end of 1987, and Rod Tyler Loiza took over the vocal duties in 1988. A new demo was begun, and members of the band attended the 1988 CMJ convention in NYC. While at the event, OVERLORDE was interviewed for West German TV. But the group disbanded late that year after only a few shows with Rod and before the demo could be fully completed. The 1990's saw each of the original members continue music in one form or another. John reformed his previous band FINAL PLEA, and was involved with other local projects. Mark formed BREAKER M.E. , then went the solo instrumental route up until he developed his voice to the point of singing lead. Dave went on to various original and cover bands including PERSIA and ICHABOD CRANE. John, Mark, and Dave remained in touch, and both John and Dave have worked with Mark on musical projects in one form or another. OVERLORDE experienced a revival of sorts in Europe, specifically in Greece and Germany. This was brought to the band's attention in December 1999. The EP appeared on collector "want lists", and the band was contacted about releasing more material. 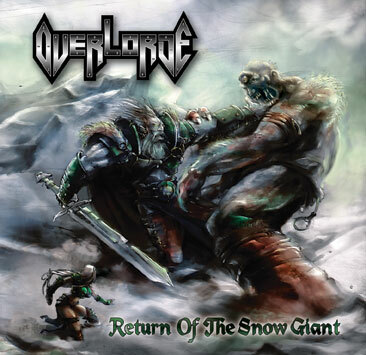 While some confusion existed with similarly named bands, this OVERLORDE acquired the U.S. trademark and it was clear that the demand was for the EP released on Strike Zone Records. There certainly was, so the band reunited in July 2000. They released the album "Return of the Snow Giant" in 2004, which received great reviews in magazines and websistes from all over the world.